Simply drill the two mounting screw holes, thread the jack into the Electrosocket, and screw it in place to hold the jack firmly in place for the next millennium. Handy for speaker cabinets, too! 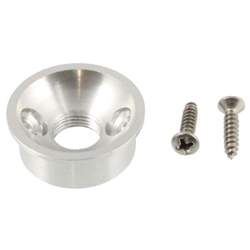 Electrosocket Jack Mount for Tele® guitars accepts a standard 1/4" (3/8 x 32 thread) Switchcraft Output Jack (not included) and fits a standard 7/8"-diameter hole, without damage to the guitar.